The effects of malnutrition during a mother’s pregnancy are not only passed on to her offspring but carried on to the next generation as well. Photo courtesy of Shutterstock. 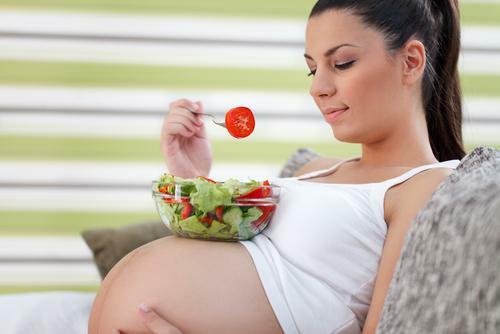 During pregnancy, a woman’s diet greatly affects her developing child. A pregnant woman who is undernourished, whether due to poverty or poor food choices, places her child at greater than average risk of developing obesity and type 2 diabetes. Now, a new study conducted with mice demonstrates the effects of malnutrition during a mother’s pregnancy are not only passed on to her offspring but are also carried on to the next generation, increasing the risk of disease for her grandchildren as well. “We have to see if some intervention can interrupt this vicious cycle,” Dr. Mary-Elizabeth Patti told Medical Daily. Patti, of the Joslin Diabetes Center and Harvard Medical School, is co-author of the study published in Science. It is easy to understand how we inherit genetic characteristics from our parents, since we acquire half our genes from each. What is difficult to comprehend is how we also inherit epigenetic effects, external influences that activate and deactivate our genes. One example of an epigenetic effect would be revealed by scientific studies of undernourished mice and the effects on their grandchildren. Not only are the offspring of an undernourished mouse born smaller and eventually develop diabetes, but their children are also born small and develop diabetes — even when their own parents have been properly nourished throughout their lives. Professor Anne Ferguson-Smith of the department of genetics at University of Cambridge explains a possible reason for this mysterious natural development: "When food is scarce, children may be born 'pre-programmed' to cope with undernourishment,” she said. Additionally, scientists believe epigenetic effects may be caused by methylation, a process by which the molecule methyl attaches itself to DNA and from there exerts an influence, switching genes on or off. In a new study, Ferguson-Smith, Patti, and their colleagues at the University of Cambridge and Harvard Medical School explored environmentally-induced methylation more deeply. As a model, the scientists used mice to not only demonstrate the impact of poor nutrition on offspring but also to examine the mechanisms by which this effect passes down through the generations. First, the researchers analyzed the methylation patterns in the sperm of offspring mice and compared them to the sperm of offspring mice from well-nourished mothers. The research team discovered the offspring mice’s DNA was less methylated in 111 regions. Plus, these regions were primarily clustered in the non-coding regions of DNA — the areas of the genome responsible for regulating other genes. As might be expected, then, the genes next to these methylated regions were not functioning correctly — concrete proof that the offspring had ‘inherited’ a memory of under-nutrition. Next, the research team examined the sperm of the grandchildren. Unexpectedly, though the grandchildren showed altered gene expression, the methylation changes had disappeared from their DNA — or was no longer being transmitted via methylation. Patti noted how these results, both the occurrence of epigenetic changes and their "wearing off" over time, made sense from an evolutionary standpoint. After all, environments change and our bodies need to adapt so that we can move from feast to famine… and back again. “This could give us some optimism that any epigenetic influence on our society's obesity and diabetes problem might also be limited and/or reversible," Patti said. Source: Radford EJ, Ito M, Shi H, et al. In utero undernourishment perturbs the adult sperm methylome and intergenerational metabolism. Science. 2014.